MANILA, Philippines – Gilas Pilipinas survived Tyler Lamb and the rest of Team Thailand, 81-74 as the national team opened their Southeast Asian (SEA) Games campaign on Sunday, August 20, 2017 in Kuala Lumpur, Malaysia. 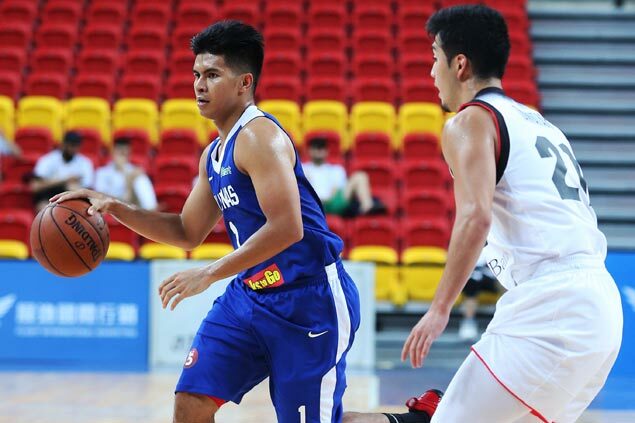 Gilas Pilipinas faced its toughest rival in the 29th SEA Games right at its very first game against Thailand. The Thais, bolstered by ABL superstar Tyler Lamb, looked tougher and sharper in paper at least with an ultimate goal to dethrone SEA powerhouse, Philippines. Basketball analysts say that Philippines has already found its match with Tyler Lamb on Thailand’s roster. But the Thai-American stalwart started cold until he finally found his rhythm after half-a-quarter for 5 quick points. Philippines’ guards led by Baser Amer together with Almon Vosotros and Mike Tolomia kept Philippines’ decent scoring distance by firing from the three point territory. Battered and bruised Fil-German Christian Standhardinger who flew straight to Malaysia from FIBA Asia Cup in Lebanon entered the floor in the latter phase of the opening period to fortify the frontcourt and solidify Philippines’ scoring advantage. Standhardinger helped the team posted a double-digit lead after the first ten minutes of the game, 22-12. 2nd quarter didn’t go as planned for Team Philippines as the nationals were outrebounded defensively by the Thais. Midway of the second, the crowd went frenzy as Kobe Paras checked-in. The arena was filled by “Kobe, Kobe” chant and even got louder as the young Paras made an emphatic block as he announced his entry. Thailand immediately recovered and managed to cut the lead from as high as 13 to just 6 points. Tyler Lamb however got cold again and missed multiple shot attempts. Bobby Parks Jr. made it harder for Lamb to hold the ball and put some terrific stoppages on the Thai. Ananti’s long shot and put back stole the lead from Philippines and shifted the momentum to Thailand. Christian Standhardinger’s charities from the line however promptly snatched the advantage back from the Thais until the end of the 1st half, 36-34. Kiefer Ravena and Troy Rosario opened up the 2nd half strong for Philippines. Likewise, Tyler Lamb started to connect from all angles that gave Thailand the lead once again, 46-45 with 4:30 remaining in the third. Both teams’ big men battled it all out during the dying minutes of the 3rd period. Troy Rosario went toe-to-toe against Thailand’s Klahan under the rim. Philippines hung on a 1-point 60-59 as the third canto wrapped-up. Rebounding was still Gilas Pilipinas’ problem as the final quarter unfolded plus poor free throw shooting. Standhardinger alone missed 6 straight foul shots that could have given Philippines a better margin. Tyler Lamb tied the game anew, 62 all with over 7 minutes left in the ball game. Tyler Lamb’s superb basketball performance came to an end as he obtained his 5th and last personal foul after hacking Bobby Ray Parks. Jr. off a turnover. Lamb posted a game high 17 markers prior to fouling out. Thailand held the lead for over 5 minutes of the game until Bobby Ray Parks. Jr and Kiefer Ravena completed their free throws off excellent defensive stops. 73-71 in favor of Gilas Pilipinas with under 3:23 left in the game. Christian Standhardinger delivered the insurance basket for Philippines 79-74 with 40 ticks remaining in the ballgame. The Fil-German added 1 more to close the game 81-74 for the first win of the tournament. Gilas’ next assignment will be Myanmar on Tuesday, August 22 at 6:30PM.